Cleaning up and cleaning out is the motto around our home. Life is busy though so even my most coveted space in the house suffers from neglect. 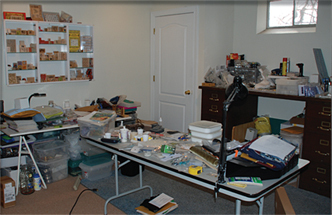 In an effort to reclaim my personal jewelry-making workspace and avoid the embarrassment of having people see my studio in such chaos--it was time to dig in and put in some hard work to get things under control. This was a good time to also develop a plan to make it easy to keep it that way. 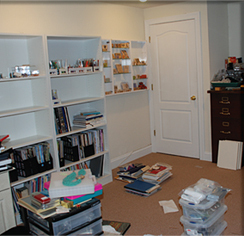 If this story sounds familiar, here's a guide based on my recent ''big clean up'' to help you reclaim your workspace. Evaluate your space and assess what works and what doesn't; figure out what can be changed in the structure of the space and then take measurements to know what size area you are working with. I needed less table and counter space and more storage cabinets (I had been storing boxes under the tabletops, which made the space seem unkempt, even when things were in order). Next I was off to the [home goods] store to see what might be available to help solve my storage problems (and before my husband pushed the laundry-room cabinets my way). I carried a storage bin around the store with me (one that matched those I was already using), so I could test it out in the space. I placed the bin in each cabinet and storage unit to be sure the shelving wouldn't be too shallow. I found the perfect cabinet and couldn't wait to get it home! I also picked up additional storage bins (as I knew I was going to need a lot more) so all the containers inside the cabinet would match (part of the plan to help bring order to the space). Now comes the fun part--it's time to move back into your organized space. 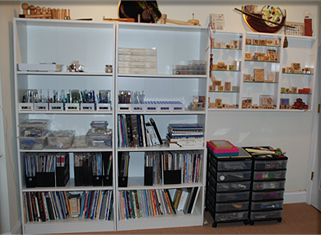 Sort all of your components and fill the storage containers with beads, findings, tools and supplies. I found sorting by color to be the best way for me to store my glass and gemstone beads. I sorted findings by type, Bali-style and Hill Tribes fine silver beads by style and Swarovski crystal by color, with each color then placed into zip-top bags, labeled and organized in a larger storage container. Every designer sorts things differently. If you're not sure which way will work best for you, pay attention to how you approach a design and then determine what you reach for when you begin to put the design together. 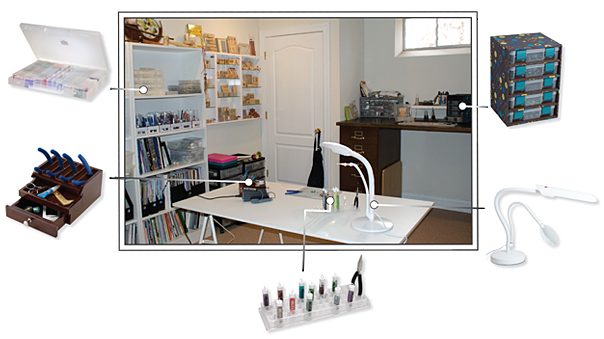 This will help you assess the best way to sort your jewelry-making supplies. It's important that your workspace be comfortable, usable and well-lit. I've always preferred a large worktable because it gives me lots of room to spread out and work on multiple projects at the same time. However, this also became an issue because I never truly cleaned the table up. I decided to downsize my main worktable to help avoid this. I added two task lights to the worktable I chose and put a light with magnification on a counter-height table at the back of the room where I tend to do more close-up work. The new lights, combined with the overhead light, have really helped to make my work area more usable and comfortable. The Final Step: Get to Work! Now you can enjoy your new jewelry-making workspace and be proud to show it off to anyone who may be curious what you do in ''there.'' 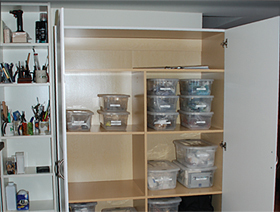 This is the first segment in a multi-part series on storage ideas and specific solutions for beading and jewelry-making needs. We would like to share some of the customer comments we received in response to the article "The Big Cleanup" as featured in an email newsletter. Please keep in mind that the comments expressed below are those of our customers and do not reflect the views of Fire Mountain Gems and Beads. ''I truly appreciated your article: The Big Cleanup because I once had a wonderfully organized, well-lit work room in my basement--until the remodelers who needed to get to the piping in the basement ceiling threw everything into a big "pile" onto the one side and removed many ceiling tiles without replacing them. I am working at a temporary table upstairs in the living room and tackling the basement and putting it back in order seemed like an insurmountable task for me as I cope daily with the after effects of an auto accident, two cancers and fight COPD from the chemo. But, this article has given me the courage and drive I needed to go back down there and reclaim my very solitary space where I could truly create. It was a welcome inspiration in my email this morning. I especially appreciated the tip on the shelving which gave me an idea to move my vintage collection pieces from their storage space under a liquor bar used by the previous owners, to their own shelving, possibly upstairs, and use that space to store my bins and plastic boxes under the bar space which was by the work tables. Having managed the front office for a national jewelry wholesaler for two decades, I came to realize the importance of keeping all work areas neat, organized and clean. In the creative jewelry I now do, that is even far more important to avoid distraction and to be able to "step back" from a layout to observe the symmetry of the design. The only thing I don't like is that now I have to spend some money on shelving that I could be spending on the beautiful components sold at FMG!